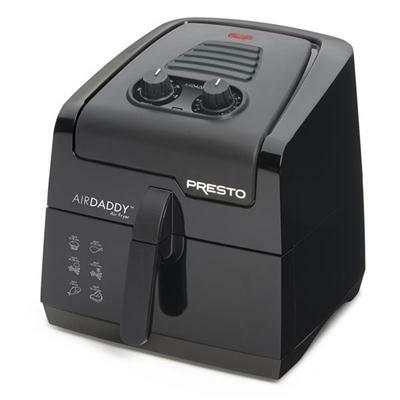 Indoor electric turkey fryer cooks a moist and flavorful turkey in about 60 minutes. Motorized rotisserie continually rotates the turkey in and out fo the oil for perfect results while using less oil. Uses only 5 liters of oil, about a third less oil then other electric turkey fryers. Fries turkeys up to 15 pounds in about 4 minutes per pound. Basket replaces rotisserie for deep frying chicken, fish, fries and more. Boils and steams too. Great for vegetables and seafood. On/off switch with power light. Adjustable thermostat for easy selection of a variety of frying temperatures. Signal light shows when oil is ready for frying. Fries with the cover on to reduce splatter. 1800 watt immersion element provides quick preheating and fast oil temperature recovery. Heating element and enameled pot are removable for easy cleaning. UL listed. Stainless steel body.